1305580982 -Consistently praised for its engaging writing style, currency, and visual appeal, MEDIA/IMPACT: AN INTRODUCTION TO MASS MEDIA, 12th Edition focuses students on today’s digital mass media industries and support businesses as well as the legal, ethical, social, global, and technological issues that these businesses face every day. The twelfth edition focuses on convergence–how the mass media industries are intersecting to deliver content and how audiences are adapting to the new mass media marketplace. 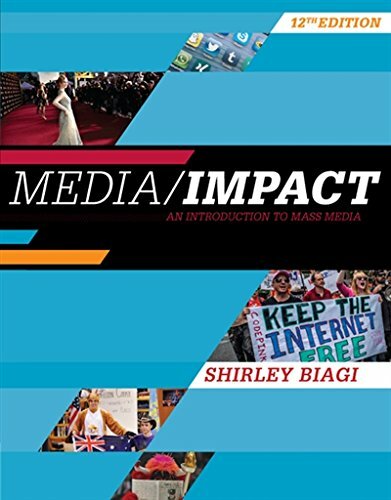 Providing thorough yet balanced coverage, the author grounds her discussion in the business aspects of all the mass media industries, with concise histories of each industry plus an insider’s look at what it’s like to work in each business. The new edition delivers the most up-to-the-minute coverage available of such emerging topics as digital delivery, net neutrality, media industry consolidation, social media, mobile media, and much more.